The backs of the books stand in rows. I know them all still, I remember arranging them in order. I implore them with my eyes. Speak to me – take me up – take me, Life of my Youth – you who are care-free, beautiful – receive me again. 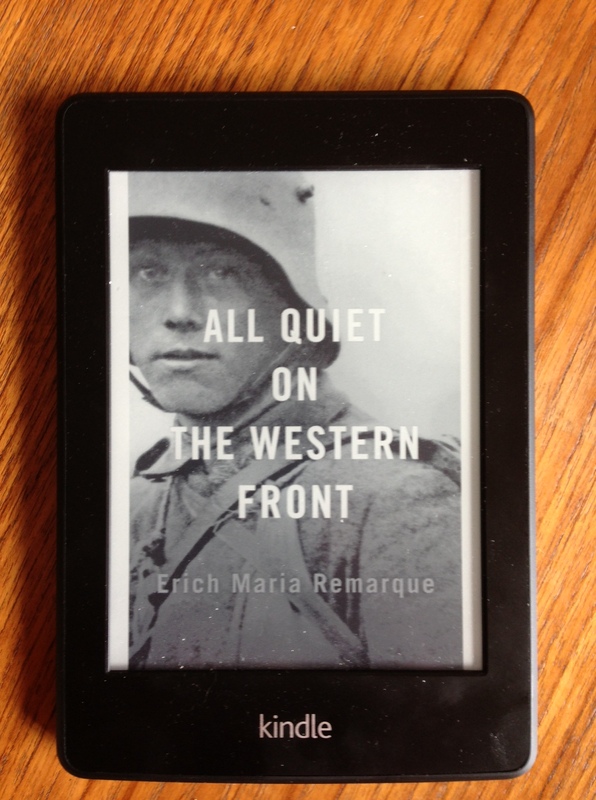 As a follow-up to Julien Gracq’s World War II novel Balcony in the Forest, I thought I needed to read one of those classics I had managed to avoid for decades – Erich Maria Remarque’s anti-war novel from the First World War All Quiet on the Western Front, which seems to have been in print continuously since it was first published in 1929. I’m glad I did. The novel focuses on young Paul Bäumer and some of his schoolmates, who find themselves transformed by the war and their efforts to survive it. “We have become a wasteland,” Paul observes of his generation. 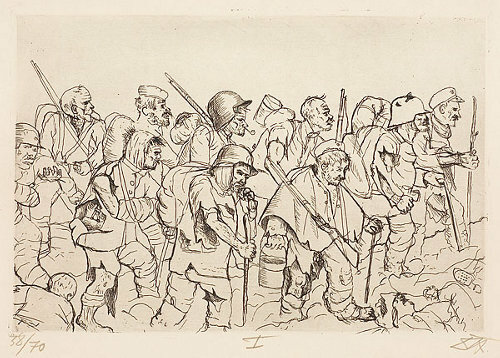 They have been betrayed by their teachers and the leaders, they have no personal animus against the French or the Russians – except that they have been taught to see them as the enemy – and it is they who find themselves on the front lines. “Well, I’m not one of them,” grins Tjaden. As a war novel, All Quiet is surprisingly still relevant more than eighty years and scores of wars after it was written. The scenes of trench warfare, aerial strafing, mustard gas, intense shelling barrages, and vicious hand-to-hand combat are utterly nerve-wracking and are as gruesome as anything I’ve ever read. Few books have suggested the horror and chaos of warfare quite like this. But equally important is what happens when Paul returns home to his mother and home town for a few weeks of leave. He suffers from what we would likely call post traumatic stress syndrome and he finds there is simply no way to bridge the gulf between those who have seen battle and those who have not. Everyone asks what the front is like, but he cannot describe it and they would never really understand. “Attack, counter-attack, charge, repulse – these are words, but what do they signify?” Language, Paul realizes, has failed him. After a few days futilely struggling to retain any sense of his prior life, Paul is ready to return to the front and to his band of fellow soldiers who share this war with him. 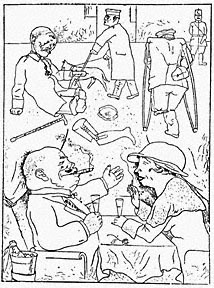 Similarly, All Quiet is full of biting satire that calls to mind George Grosz, whose work often captured the gulf between Germany’s fat cats and the proletariat forced to begged on the streets and fight their wars. Here, Paul’s former teacher Kantorek, who smugly and patriotically urged his students to sign up, finds himself drafted, while some of his former students take their revenge in handing out his new gear. I see Kantorek and I am scarcely able to stifle my laughter. He is wearing a faded blue tunic. On the back and in the sleeves there are big dark patches. The tunic must have belonged to a giant. The black, worn breeches are just as much too short; they reach barely halfway down his calf. The boots, tough old clod-hoppers, with turned-up toes and laces at the side are much too big for him. But as a compensation the cap is too small, a terrible, dirty, mean little pill-box. The whole rig-out is just pitiful.